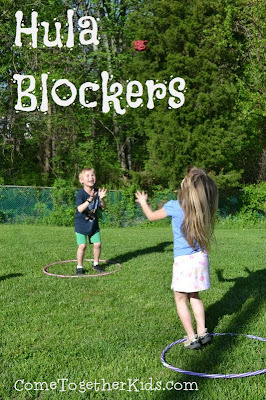 Now, I can't remember what name they gave the game in the magazine, so we decided to call it "Hula Blockers". The kids loved chanting " Hu-la Block-ers, Hu-la Block-ers" while someone was preparing to throw. I loved how totally simple this game was to set up and play, yet still really fun for all of us. All you need is a couple of hula hoops and a bean bag. Set the hula hoops flat on the ground several feet apart (ours were about 8 feet or so). To play, each player stands in their own hula hoop and attempts to toss the bean bag into the other hoop. The defender tries to block the bean bag from landing inside the circle, by using their hands, feet, head, etc. to deflect it. A point is scored each time a bean bag successfully lands inside your opponents hula hoop. A low toss can be blocked with your foot. I'm sure we'll be playing this game a lot this summer. When I started this blog, my goal was to share some of the projects and activities my kids and I have enjoyed, with the hope that others might enjoy them as well. That's why I really love it when someone leaves a comment that they like one of the ideas I've shared. And, I really, really love it when a reader takes a minute to let me know that they actually tried a project and it turned out well. 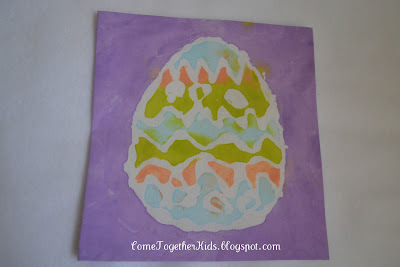 So, you can imagine how much I really, really, really loved getting an email from Jenny sharing pictures of the glue batik Mother's Day project she did after seeing our Glue Batik Easter Fabric post. She had the great idea to do the batik on fabric, then frame the finished artwork as a gift. Check out these gorgeous flowers her children painted and how amazing they look framed. 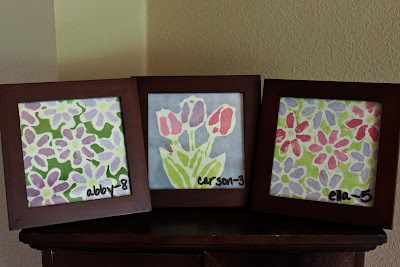 I totally want to some more Glue Batik with the kids and frame it like this! She even made a great collage showing her kids' involvement with each step. Thanks so much, Jenny, for taking the time to share your project with me. Oh, and if any of you are in need of some graphic design work for photo cards or other gifts, I was browsing Jenny's website, Pixy Print Lane, and she does some great work. I'm sure if you needed some graduation announcements or other designs she'd be able to work with you to create something special. Just a quick post to share the fun technique we used to decorate Easter eggs last week ~ using crayons to color on still hot, just boiled eggs (thanks to Family Fun for the great idea!). Pretty neat, huh? The crayon wax melts right onto the egg. They were really simple to make and the kids really enjoyed it. 1. Hard boil your eggs. While my eggs were boiling, I turned my empty egg carton upside down and cut off part of it to make a holder for the hot eggs. 2. When the eggs have finished cooking, take one out of the hot water and set it on your handy holder. Use your crayons to draw your design or pattern. NOTE: The eggs are definitely hot to the touch, but my kids were able to hold the egg steady with their fingertips while coloring, then letting go for a few seconds when it got too hot. 3. Allow the eggs to cool. The crayon wax will smear a bit when it's still warm, but once cool, stays on fine. These faces say it all ~ they LOVED this Candy Hunt!!! This year was the first Easter that we did not travel to visit relatives and just stayed home instead. While we definitely missed seeing our families, I really enjoyed starting a few new traditions just for us. Well, I hid it before I hopped away! To find the sweets I left for you! Then look above and look beneath. Hidden in the bathroom vanity. and you will find some treats from me! Hidden next to the Wii. Where do we put our dirty dishes after dinner? Check out that spot, it might be a winner! Go look in that spot and you might find some more. Will there be candy there? "Perhaps," I say. The final bags hidden in their playroom with a small chocolate bunny. The kids really loved this little candy hunt and I truly loved seeing their faces and their excitement as they solved each clue and gathered more candy. Plus, even though they still got a lot of sweets, I was actually able to give them a lot less than in previous years ~ the amount of candy wasn't noticed because they were so excited about finding it! 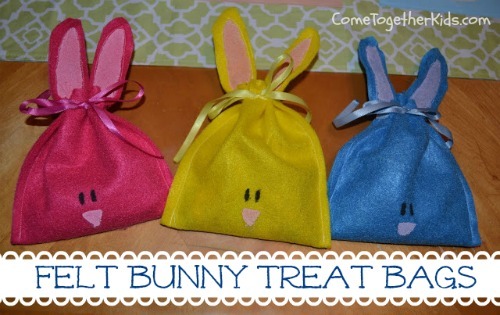 I came across the idea for these adorable felt bunny bags on this great blog, Creative "Try"als. I thought they would be perfect to use instead of plastic eggs in my kids' Easter baskets. I made a few little changes to the cute bags Sue made. Because I made 15 ( five for each kid ), they took a bit of time, but they turned out really, really cute. The kids LOVED them and I know I'll use them for years to come. Make sure you also check out the really fun Easter Morning Candy Hunt we did with our bags. 1. Cut your felt pieces for each bunny. The size is pretty much up to you, depending on how large or small your want your bag. I cut mine to be approx. 6x9" on the fold, so opened up they'd be 6x18". If you're using the felt sheets, you'd fold it in half and cut to make two 6x9" pieces. My felt cut out with the fold at the bottom. 2. Now, cut out the ear shapes from each rectangle. Starting to look like a bunny. 3. Sew the front and back pieces together, leaving the space between the ears open. Because mine was cut on the fold, I didn't have to sew across the bottom. If you used two pieces, you'll sew the bottom too. Edges sewn with space between the ears left open. Painting on the bunny's features. 5. Let your paint dry and get your ribbon ready. All fifteen bunnies soaking up the sun on my back deck. 6. On the back of each bunny, cut two small vertical slits in between the ears. Then on the front, cut two pairs of slits closer to the ears. These will help hold your ribbon in place when you tie your bags closed. Fold and cut the slits. A little tougher to see, but the pairs of cuts are near the ears. 7. Thread your ribbon through. I added a drop of hot glue on the back of each bunny where I threaded the ribbon through to hold it in place, since we'd be reusing them and I didn't want to keep replacing ribbons. 8. Fill your bunny treat bags, then tie them closed, adjusting the ears if necessary. Good thing they also got toothbrushes and floss in their baskets! If you have more than one kid, make sure you put EXACTLY the same amount in each bag! That's it! How super cute are they? See how I used these bags for a cute Scavenger Hunt HERE! Now, I know that a better seamstress could have made a really incredible table runner from scratch, but this project is the perfect solution for someone like me who can sew just well enough to put things together (or even someone who doesn't sew at all). It looked really pretty on our Easter table and because it has the kids' artwork on it, I know I'll treasure it for years. Now, wait till you see how simple it was! 1. On your fabric artwork pieces, fold over 1/4" to the wrong side on each edge and iron. Look how lazy resourceful I am, using a folded towel instead of going downstairs to my ironing board! 2. Cut a piece of Heat-n-Bond that is just slightly smaller than your finished artwork piece. Iron to the wrong side of your artwork. I got it as close to the edges as I could to help catch the raw edge. 3. Decide on the placement of your pieces, then peel off the paper backing and iron into place. Somehow, my squares are slightly different sizes! Oh well! 5. If you have a sewing machine and want a little bit more finished look, simply topstitch around each square close to the edge. That's it! Your new table runner is finished! Once again, admire the idea, but ignore the wrinkles! How easy would it be to do something similar for each holiday or just for everyday? You could use the Glue Batik technique, or any other fabric decorating technique, and feature your kids' creations at the dinner table. I love them, I truly do, and I couldn't imagine my life without them. However, there are those days that are harder than others. A lot of times, it's on one of those rough days that they do something that just makes me stop, take notice and think, "This is Why I Love Them!" Yesterday was one of those rough days. The kids and I had been home with each other for several days on Spring Break. We were stuck at the house waiting for a repair man. They were bickering because they didn't want to play together, then whining that they were bored when they were playing separately. After lunch, I sent them out into the backyard to get out of my hair before I lost it to get some fresh air and run around. It's a skink and basically looks like a fat worm with legs and a head! All fighting ceased and they jumped into action! The girls got a plastic container and immediately started making a home for "Sammy" complete with a moss floor, dandelion decorations and a bottlecap of water for a "spa". They worked together so nicely and with such joy, I couldn't help just watching them and feeling glad that I've been blessed to be their mother. 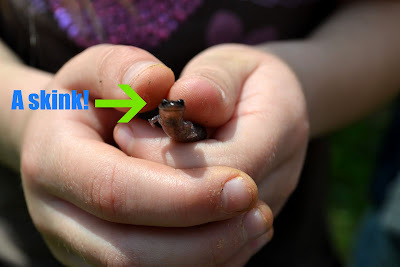 The researched list of the dietary favorites of a skink! Of course, the fighting resumed within an hour and the skink was dead by this morning, but I enjoyed the moment while it lasted!